Following a recent audit, John Lawrie Group has gained Verify status from First Point Assessment (FPAL), the oil and gas industry’s supply chain database in the UK and Netherlands. 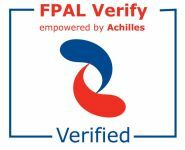 FPAL is widely regarded as the sector’s supplier management system and the Verify scheme was developed by the industry for the industry. It aims to raise industry standards, enable information sharing within the sector and reduce the burden and duplication of repetitive audits by replacing them with a single shared one. In order to achieve Verify status, the Scottish metal reprocessing, steel trading and environmental services company underwent a verification visit over two days from an FPAL external auditor. The visit evaluated the Aberdeen-based firm’s capabilities in the areas of health and safety, environment and competence and training. The results of the visit are shared online between purchasers who participate in the Verify scheme. It is designed to allow FPAL purchasers to make a fair comparison of suppliers and identify those who exceed minimum certified standards. “We are very pleased to have strengthened our FPAL record by securing Verify status,” said Ray Grant, environmental director, John Lawrie Group. “As a supplier we believe it is important to continually review our accreditations and Verify represents a step forward from the Registration status that we previously held. Established in Aberdeen in the 1930’s as a scrap metal merchant, the John Lawrie Group now offers a diverse range of industrial services and has developed an enviable reputation for quality customer service. It is one of the country’s leading privately owned companies and employs a 90-strong workforce across operations in the UK, America and Europe. For more information about John Lawrie Group telephone 01224 871844.